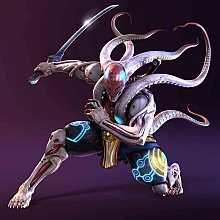 Hello all, Like you i am a Yoshimitsu fan and have been one since his first appearance in Tekken 1. I still play with him in Tekken 6 and am currently TOP number 2 Yoshi player on Xbox live. GO YOSHI! I also have vids on youtube if you want to check them out, i am always happy to hear comments and advise. Hi there Welcome to Yoshi Team! I saw your vids, they are good! Welcome YoshiMoshi!! Nice fight vids! Good mixups!! YOSHIMOSHI : Hello all, Like you i am a Yoshimitsu fan and have been one since his first appearance in Tekken 1. I still play with him in Tekken 6 and am currently TOP number 2 Yoshi player on Xbox live. GO YOSHI! I also have vids on youtube if you want to check them out, i am always happy to hear comments and advise. Greetings! Welcome to YOT YOSHIMOSHI. The vid bellow is ThinkBig321 the #1 Yoshi on XBoxlive and his wins with Yoshi's Finger Bang move. Awesome name! Oh and of course, awesome vids! Welcome to YOT. I hope you make lots of great friends here. Enjoy! Thanks for the welcome everyone. And i finality got my vids working again and just upload a new one. New youtube vid of my Yoshi. Just search Jaimitsu and they should pop up.